Unite4Chinatown 團結為唐人街 is a campaign organized by CCAP’s Chinatown Planning Group, in response to how gentrification is transforming Chinatown and threatening its future. The Group has initiated a petition campaign calling for an immediate moratorium on all market development projects in Chinatown until there is comprehensive community consultation and clear policies to protect the future of Vancouver’s Chinatown. The online petition, calling for the moratorium is hosted at http://bit.ly/unite4chinatown. 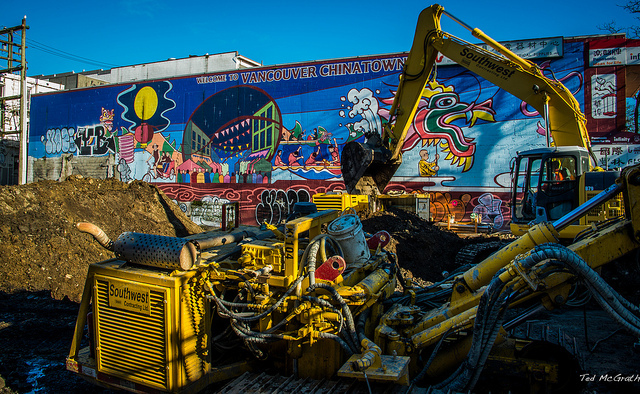 Join us in calling for the protection of Chinatown’s character, heritage, and cultural assets! SPREAD the online petition (http://bit.ly/unite4chinatown) to your networks via email, social media etc. HELP TABLING – The more volunteers we have, the more awareness we create and the more signatures we will collect for this petition. Contact King-mong Chan (kingmong_chan[at]hotmail.com / 778-996-8223) if you are interested in helping with tabling.